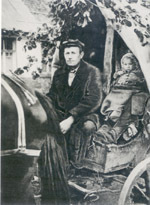 Description: On the trek out of Transnistria; handwritten on the back in red ink "zu Gertrud Braun"
Description: Handwritten on back "71751 Ukraine Dt. Bauern, die ihr Vieh u. landwirtsch. Geräte über den Bug hatten raften[?] 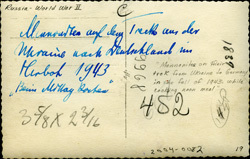 müssen, [illegible] in ihre befreite Heimat zurück"; and in Cornelius Krahn's handwriting "Menn. 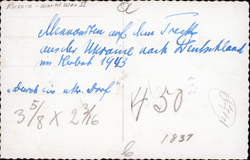 Tractorists during the German occupation of the Ukraine in 1941-43"
Description: handwritten on back "Treckfuhre[?] 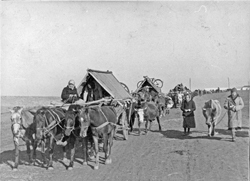 auf dem Weg durch Rumänien"; also "Gertrud Braun"
Description: Mennonite refugees on the trek from Ukraine to Germany, mud-caked wagon wheels; used in Mennonite Life, January 1951, p. 10, and October 1955, p. 156. 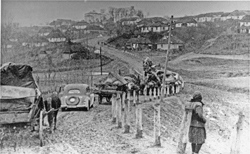 The print from which the scan was made was not an original print; original is missing. 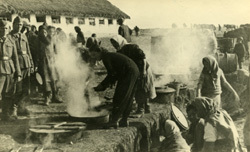 Description: Mennonite refugees on the trek from Ukraine to Germany in fall 1943, "Futterpause"